← Sunday Coffee – Sometimes, I just want spoilers. 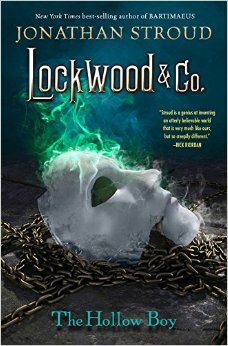 Lockwood & Co. are still on the case(s), this time trying to contain one of the largest sources of supernatural outbreak since the Problem began. Only now, the team is disjointed. Business has been booming, the team is split up more often than they’d like, and they’re living in a pigsty with no time to clean. Enter Holly, a new assistant meant to field calls, set up appointments, clean house, and (in a pinch) come out on assignments with the others. With this newfound efficiency, however, Lucy (our narrator) feels shoved aside and discarded, unappreciated and patronized. This helps no one when it comes to the Problem. I love these books. I’m so glad I stumbled upon the audio version of The Screaming Staircase, and only wish I’d been able to get my hands on audio versions of The Whispering Skull and this book. Audio or not, the book was fantastic. Captivating, dragging me along pleasantly, breaking me out of my reading malaise. It was awesome. Doubly awesome was the set up of a longer arc in this book. I have no idea if this series has a planned end, or if it’s just going to keep going as long as people are reading it. Either way, this is the first time there seems to be a long-running series arc rather than individual book arcs (though of course it had that too). I’m excited to learn more about the Problem and about ghosts in general, and I hope that grows even more in further installments. One more thing to note: These are middle-grade books, and I rarely read middle-grade because I’m well beyond the target audience and I find many of the tricks/writing styles too young for me. That is not the case with this series. The Screaming Staircase had me freaked out and in chills a few times (it was an excellent audiobook). The Whispering Skull wasn’t quite as good, though I admitted at the time this was probably my disappointment over not having an audio version, and it was still very good, not at all too young. The Hollow Boy was extremely creepy in places, flesh-crawlingly creepy, and none of these books have felt like they’ve been cut shallow or young for the audience. There’s a lot of very interesting psychology and philosophy and the things you’d find in older books, but still light enough to work for kids. It reminds me, in some ways, of Diana Wynne Jones’ style of making her books all-ages appropriate, and I really appreciate that. That’s hard to do, and Stroud does it very well. Thumbs up! Reread via audiobook in May 2016: Emily Bevan reads the audio of this one, and just like with The Whispering Skull, I had to adjust to entirely new voices for all the characters. This is probably my least favorite of the audiobooks. It wasn’t bad, but the characters were different from how I hear them, much younger (especially George, who sounded about nine years old here). This entry was posted in 2015, 2016, Children's, Prose and tagged atmospheric, audio, circus horror, dream-invader, favorite, memorable, reread, RIP-worthy, speculative. Bookmark the permalink.